The Book About Thinking Preferences, Motivation and Engagement! This book explains all about Thinking Preferences and their impact on motivation and engagement in the professional context. Leadership is about supporting people to cope with change, whilst management is about coping with the change. Leaders set the course, whilst managers are planning and budgeting. Leaders concentrate on developing the personal power of their employees, managers recruit and organise employees. Leaders motivate, managers control. Leaders look out for opportunities, managers look out for constraints. A well led company needs both. This book helps to identify the potential of both and to distinguish one from the other. Also this book is intended to help with finding the best employees – not those, who make the best impression – and with leading them in the optimum way. It supports coaches and trainers in guiding their clients and participants in a more intensive, effective and sustainable way. You will learn about the difference between motivation and engagement. This book shows, why motivation is not enough. Today we can not only measure the engagement within an organisation, but we can also identify the leverage points necessary to enhance it. The author investigates in the book the different aspects of burn-out, from the complex costs for various stakeholders, to the structure and process behind it. He describes the cost of burn-out for all sides. He shows that burn-out is not something that just happens, but that there is a certain set of thinking preferences and a mental strategy that leads to burn-out. He reveals the thinking preferences that lead to burn-out and goes on to explore how existing burn-out patterns can be resolved, and more importantly, how we can immunise ourselves and others against it. All of this is written in an easy to read way. The is published in English by KONA Publishing, North Carolina, USA. Title: Forget About Motivation. The author of the book is H. Arne Maus, developer and founder of the Identity Compass. The German edition of the book was in the first week of May 2009 (May 4 - May 10, 2009) the "Book of the Week" at the website of Bertelsmann Verlag and also in one of the leading daily newspapers in Germany the "Hamburger Abendblatt" from October 2 to October 9, 2009. The iPhone App to the book. ... Using the principle of "a simply tool to produce complex results". The Identity Compass offers a comprehensive framework for the decoding of thinking preferences, ... shows the Why, When and How measures that reveal our thinking and behaving patterns and how different factors in the job motivate and de-motivate us. It offers us a simple way to read and interpret the complexity of over 50 thinking preferences. How can one differentiate between potential leaders and managers? How can vacancies be filled optimally? Miscasting mean high costs for each company. 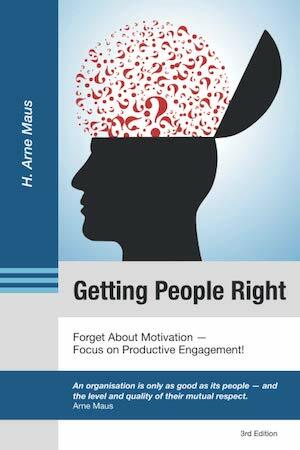 In his book "Forget About Motivation" the author H. Arne Maus shows how the measurement of Thinking Preferences may be used for selecting the right candidates, how companies may improve efficiency at work and achieve at the same time a greater work satisfaction. The idea of Thinking Preferences and their influence on the job and the measurement of work motivation are the theoretical and practical focus of the book. H. Arne Maus combines the thinking preferences and with the increasingly important topic of "burn-out" and explains how potential bullying can be identified in the company based on the measurement of thinking preferences. "Forget About Motivation" is particularly suitable for managers and employees in personnel management as a theoretical basis and practical application. But trainers and coaches will find valuable information and new approaches.